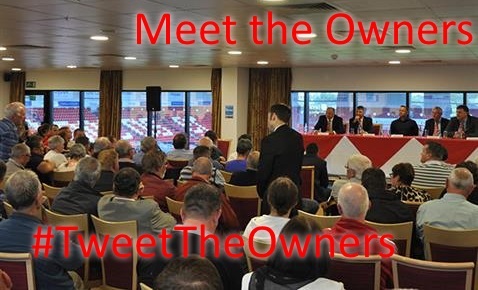 The next Meet The Owners event will be held on Wednesday 4th February 2015, starting at 6:30PM in the Jibba Jabba Restaurant in the East Stand. This bi-annual event, part of the In Rovers We Trust programme of activities, has always been well attended by supporters and has often provided lively debate from the opportunity for fans to question the Rovers' Board of Directors and seek clarity from the horses mouth on a wide-range of Rovers-related issues. The event is all-ticket as the maximum number of attendees is limited, but some tickets still remain so grab yours soon from the ticket office if you would like to attend. This year, as usual, the @VSCOfficial twitter account will be tweeting live updates from the meeting for the benefit of fans who cannot attend. Follow the events or submit questions to ask on your behalf by using the hashtag #TweetTheOwners . Fans who don't use Twitter can follow the event via the Twitter panel to the left on this site.